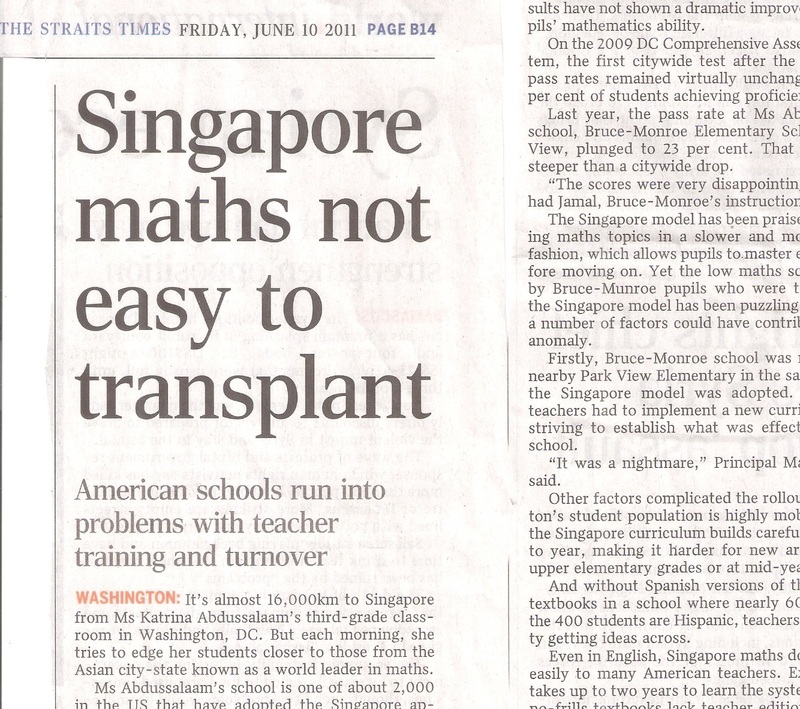 An article published on The Straits Time Singapore press on 10th June about a school in Washington D. C. facing challenges to implement Singapore mathematics into its academic programs. Bruce-Monroe Elementary School@Park View in Northwest Washington is one of about 2,000 U.S. schools in the past decade that have adopted the Singapore approach to math, which stresses mastery of basic skills and a few essential ideas, such as place value and part-whole relationships. The challenges that the school facing include high levels of student mobility, instructor turnover and a curriculum that proponents say requires a depth of understanding most U.S. elementary teachers don’t acquire in their math training. The District’s student population is highly mobile, but the Singapore curriculum builds carefully from year to year, making it more difficult for new arrivals in the upper elementary grades or at mid-year. The school, where nearly 60 percent of the 400 students are Hispanic, uses a dual-language program. Classrooms have a mix of English- and Spanish-dominant students who split time between the two languages. But without Spanish versions of the Singapore textbooks, teachers had difficulty getting ideas across. Even in English, Singapore math does not come easily to many American teachers. Experts say it takes one to two years to really learn the system. The no-frills textbooks lack teacher editions and other aids that are part of U.S. math packages such as “Everyday Mathematics.” Singapore’s elementary instructors receive significantly more math than their U.S. counterparts, who are often generalists. Finally, there is the challenge of teacher retention. Like many urban systems, the District churns through teachers. One study of payroll records found that 76 percent of D.C. teachers leave in five years or less. Many who come through alternative programs such as Teach for America and D.C. Teaching Fellows leave after two years. The article was originally published on The Washington Post with Title “ D.C.’s Bruce-Monroe school faces challenges as it tries Singapore math method” By Bill Turque on June 7. You can click the link here to read the full article. My blog on Singapore primary school mathematics is to solve and show the concept of the Singapore mathematics. Although, the original aims are to assist the Singapore parents and students working on mathematics, the blog should also benefit the US teachers and students to excel in Singapore maths. Useful information. Lucky me I found your web site accidentally, and I am stunned why this accident didn’t came about earlier! I bookmarked it. Thanks and more to come. Happy reading! Not know what have been done by the WP team. Can not even display IE9 as claim that not supported. XP only can use IE9, why stop supporting?